If you've noticed that my blog has been very quiet these past ten days or so, it's because I've been furiously framing prints. More on that later, but I wanted to let you know about the show I've been framing for, a show in the beautiful Berkshire Mountains of Massachusetts at "The Loo Gallery." Yes, "Loo" means what you're thinking. My work, specifically my Pilgrim prints, will be hanging in a bathroom! 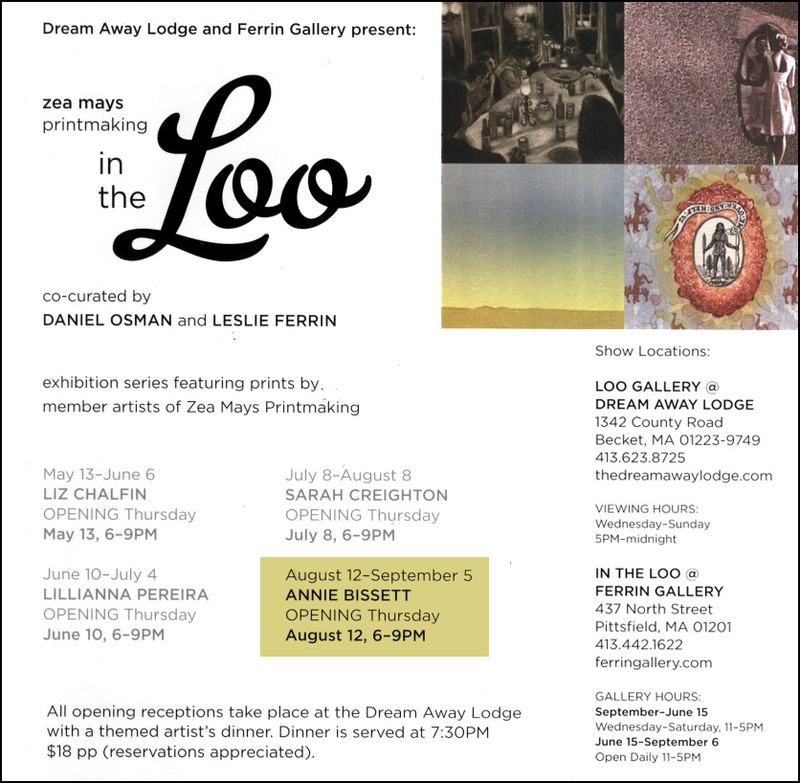 Actually, not just one bathroom, but two bathrooms -- the Dreamaway Lodge in Becket and Ferrin Gallery in Pittsfield. It's a smart idea, really. Hanging art in bathrooms means that any place -- a restaurant, an inn -- can become a gallery. A very intimate gallery. 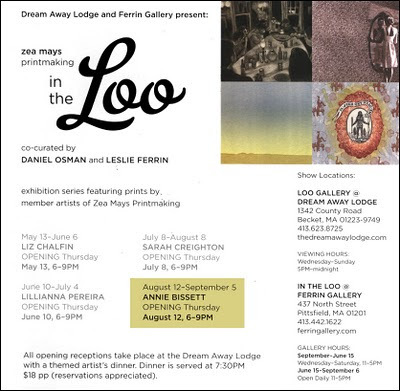 I've been to 3 shows now at the Dreamaway Lodge Loo Gallery and they've been fabulous. But the must-try culinary experience near Jacob’s Pillow is at the storied Dream Away Lodge, a restaurant, bar and music spot tucked in the woods of Becket. 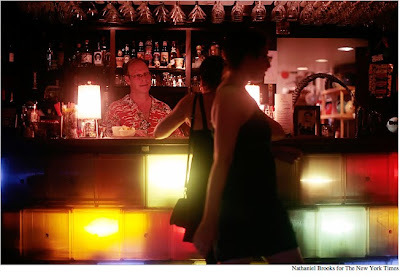 Visitors are welcomed by a bonfire, the warm neon glow of a Coors Light sign (though the cocktails are the thing to order) and fabulously idiosyncratic décor: chicly mismatched table settings, eclectic art and indefinable knickknacks. I enjoyed fresh strawberries and cream on a tray and a tart gin concoction while listening to the folk singer-songwriter Gretchen Witt. “It’s been described as Brigadoon,” said Daniel Osman, a former actor who has run the Dream Away since 1997, and who seems to know pretty much everyone — many of them artists — who walks in the door. GPS devices don’t even know how to find the lodge, as its Web site cautions. But Amy Loveless’s sophisticated menu would be at home in Manhattan. If you're in the area, I hope you'll come to the Dreamaway Lodge for the opening of the Pilgrims show and a dinner themed around the art by Chef Amy. I can't wait! I first discovered American Public Media's "Speaking of Faith" broadcast through an internet search for podcasts about Islam back in 2008 when I was working on my Mecca print. Since then, "Speaking of Faith" (SoF) has been a constant companion in my studio as I've listened, sometimes more than once, to archived interviews with well-known individuals such as Thich Nhat Hanh, Karen Armstrong, and Sharon Saltzberg as well as topical shows that delve into the complex intersections between science, religion, politics and ethics that are at play in our world. It would not be an overstatement to say that there's a little bit of "Speaking of Faith" in each of my prints. I’m hoping these films prompt you to think about your relationships — to the land, to your family, to your neighbors, to our collective heritage, to your faith — and then distill your ideas into words about what this means for you. It could be a place — a prairie night sky or an urban garden. 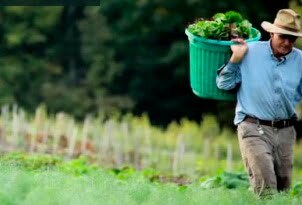 It could be an interaction with a neighbor or a local farmer — something that makes you contemplate the deeper meanings of possession of land and its care. The result: a collaboration between us and printmaker Annie Bissett to weave your narratives into a collective narrative through text and images. Perhaps some of you who read this blog would like to participate. The link to share your thoughts is here. I look forward to hearing what you have to say and to making prints inspired by your words. -Land was viewed by Native peoples as common to all with various rights to the land being saleable, while colonists viewed land as subject to private ownership and sought to purchase it with wampum as one of the means of payment. I think the North American housing bubble actually dates back this far. I made an edition of 22 of this print, 15 for the PrintZero exchange and the other 7 to be a part of the Pilgrim series. PrintZero Studios is an ever-evolving print studio and print-promoting organization created in 2003 by Brian Lane and Jeremy Cody. Every year since PrintZero's inception the two have organized a print exchange, and I decided to finally participate this year. One of the factors in my decision was that the required size of the print increased from 5" x 7" to 7" x 10" (17.8 cm x 25.4 cm). Perhaps because of my increasing farsightedness or maybe because they feel tight and fussy to make, I dislike making small prints. I decided to go ahead and make a small print I had considered for the Pilgrim series, a print about the native American beads called wampum. The word wampum comes from the language of the Narragansett, a tribe that still lives on a small portion of their ancestral land, land that we now called Rhode Island in the United States. The word means "white shell beads." 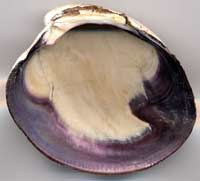 Wampum beads are made in two colors: white from the Whelk shell and deep purple from the Quahog shell (pictured here). Used by many of the Eastern Woodlands tribes, wampum beads were considered sacred, some say because of the connection of shell with water and its life-giving properties. Wampum beads were woven into belts which were created to commemorate treaties or historical events, as a memory aid in retaining stories from oral traditions, and for exchange in personal social transactions such as marriages. 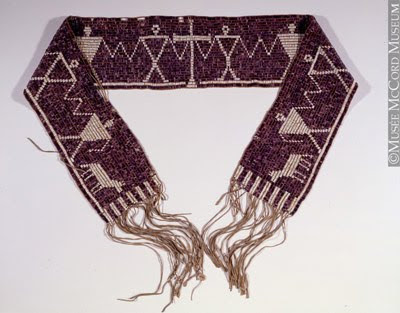 Wampum was traded, exchanged and often worn as a badge of office or ceremonial device. The woven belts often contained pictograms, so in this sense and in its role as a story-telling device it could be thought of as a form of writing. The settler colonists saw wampum a bit differently. They recognized the importance and value of wampum but they interpreted it as a kind of money (one web site I looked at speculated that this is the origin of the slang term "shelling out money") and they began using it as such. In the 17th century, wampum could be used as legal tender for many things, such as paying taxes or tuition at Harvard, and it was often used as partial payment for land purchase from the native peoples. Shortly after their arrival, the colonists opened mills to produce their own wampum more economically. Eventually these mills became the primary source of wampum in colonial America, glutting the market with devalued beads. With all this in mind, I decided to design a "wampum belt" for my print that would address the grave misunderstandings between the settlers and the native peoples about wampum itself and about land and land ownership. According to William Cronin's excellent book, Changes In the Land, Native peoples viewed land as common to all (much as we today view water and air), and when they "sold" land to the settlers they believed that they were selling various rights to the land (the right to farm, the right to fish), not the land itself. The colonists, of course, viewed land as subject to private ownership and it was this basic misunderstanding that so often led to the loss of tribal lands in exchange for a few so-called "beads and trinkets."